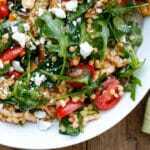 Crisp greens, tender chicken, juicy tomatoes, peppers, and mushrooms, are tossed together with warm, nutty couscous and a paprika dressing to make this Summer Israeli Couscous Salad. This unforgettable salad can be served warm or chilled, making it perfect for summer barbecues, potlucks, casual dinners, or weekday lunches. The best part about this salad is that it’s delicious when you first make it, but it’s also fantastic cold. I like to make this salad and eat it for my lunches through the week. My friend Lynne made this salad for Holly and me a few weeks ago while we were hanging out at my house for a #foodbloggersleepover. (always, always a fun time!) Holly and I went a bit nuts over this salad and we’ve both made it multiple times in our own kitchens over the past few weeks. My youngest son blew me away by declaring this the best salad ever. As a non-fan of salads, take that for what it’s worth, he eats this salad like mad anytime it’s in the fridge. Pearl (aka Israeli) couscous are tiny round balls of pasta. They are slightly chewy, slightly nutty, and nothing at all like traditional couscous. I’m not even a big pasta eater and I’ll eat pearl couscous all day long. Try this Israeli Couscous with Pistachios, Pine Nuts, and Raisins or this Lemon Couscous with Chicken and Craisins for more great ways to use pearl couscous. 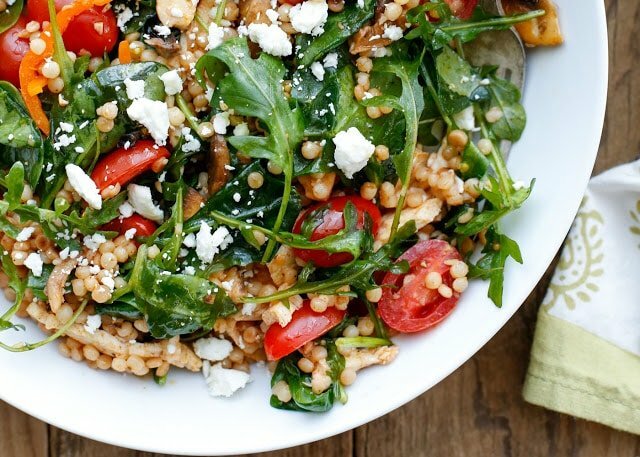 This Mediterranean Bean Salad is another great flavorful salad that’s perfect for summer lunches. Kitchen Tip: I use this knife, this bowl, this pot, this whisk, and these tongs to make this recipe. Whisk together the dressing ingredients and set aside. In a medium size saucepan over medium-high heat, warm the olive oil. Add the couscous and cook until fragrant and golden, stirring frequently, about 5 minutes. Add the water and salt and cover with a lid. Reduce heat and simmer until water is absorbed, about 10 minutes. 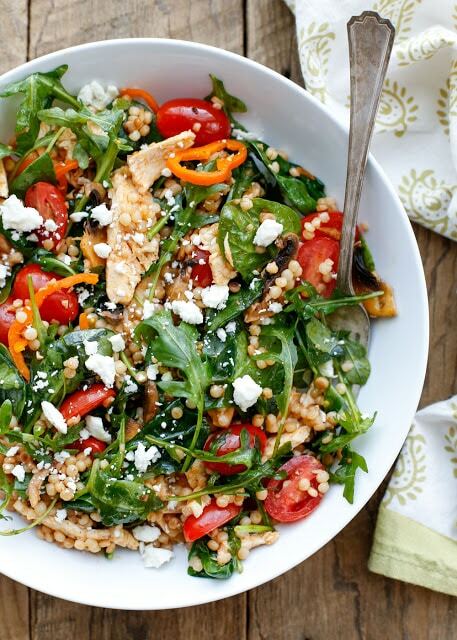 In a large bowl, combine the spinach, arugula, tomatoes, peppers, mushrooms, parsley, and chicken. Pour the dressing over the cooked couscous in the saucepan and stir to combine. 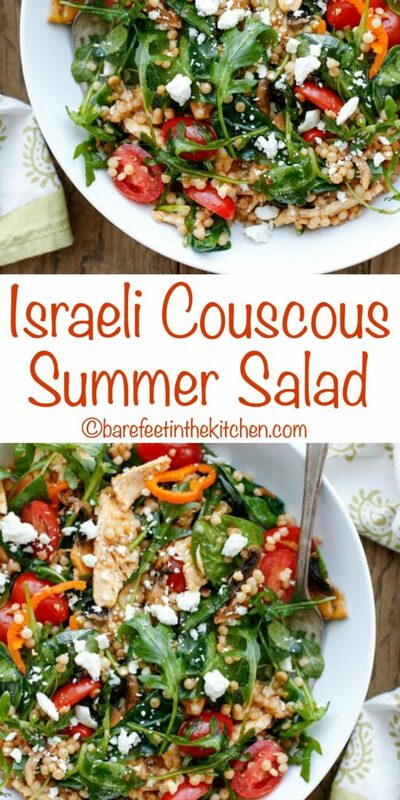 Pour the warm couscous over the salad and toss to combine and slightly wilt the greens. Sprinkle with feta, if desired. Enjoy! This recipe is easily adapted to what you have on hand. I've made this salad with traditional and with white balsamic vinegar. I've also used plain and smoked paprika. I've made this salad both with and without chicken. It works nicely as a meatless main dish or side dish. Thinly sliced grilled chicken breasts or thighs can be used. Alternatively, chopped rotisserie chicken will work as well.